A true example of compassion and perseverance, Grazyna Kolondra ’16 has dedicated her work to raising awareness of global violations of human rights. Kolondra’s films and ongoing projects reflect her own passion to make a positive difference in a fragmented world filled with injustices. Kolondra shared details of her filmmaking journey and her devotion to human justice. What in your past has given you inspiration or a unique point of view that you bring to SCA? Growing up in Poland, I was constantly reminded of the horrors of World War II. For instance, my school’s field trip to Kraków included a visit to the Auschwitz-Birkenau Concentration Camps. I could feel the pain of people who were innocently killed there. I prayed that I would be spared from witnessing similar atrocities in my lifetime; these emotions stayed with me for a long time and affected my dreams and thinking on war crime issues. My mother's family was miraculously saved during the Holocaust, thus, my mother often taught me respect toward issues of human rights and dignity; my father, on the contrary, ignited my passion for photography and film. When conducting research on international criminal law and comparative law, I dreamt of using film for social change. In order to do so, I needed first to defeat my inner ghosts. I journeyed by myself to the Auschwitz-Birkenau Concentration Camps and I documented whatever captured my heart. The phrase "Never Again" was no longer limited to the horrors of a particular time and space, but it became a personal resolve to never grow tired of becoming a voice of innocent people who are still brutalized in some parts of the world. After being accepted to the MFA Film and Television Production program at SCA, I was advised to focus on documentaries because of my expertise in international human rights law. The SCA faculty’s strong commitment to use film for social change creates a nurturing, family-like environment, which has been helping me to thrive emotionally and creatively on my projects. Could you share about the beginning development stages of your feature length documentary Crossing Desert and Sea? What inspired you to document the stories of Iraqi and Syrian refugees? While taking a class on media and social change with Professor Doe Mayer in my first year of school, I saw a photograph of a child, barefoot and barely clothed, standing in snow in front of a tent provided by UNHCR, The UN Refugee Agency. This picture broke my heart, and I was shocked to learn that more than 1,000,000 Syrian children have become victims of internal conflicts in their own country. 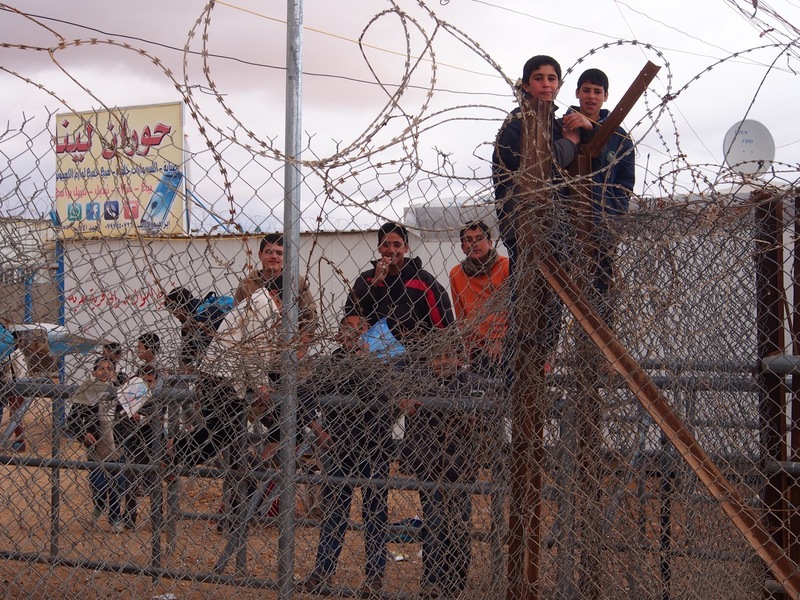 Forced to flee from the violence and unrest, they have become refugees struggling to survive in heart-breaking conditions in neighboring countries such as Jordan, Lebanon and Turkey. I started to speak about this issue with different faculty, and I took classes focusing on documentaries and production; eventually, I was encouraged to write down a treatment for Crossing Desert and Sea. While taking the Intermediate Producing class with Tim Marx, I made contacts with people in Jordan, who offered to facilitate my visit. And, at the end of the fall semester of 2014 I traveled to Amman, Jordan to gain firsthand knowledge of the Syrian and Iraqi refugee crisis. What has been your most memorable experience at SCA thus far? At SCA I have been able to work with the most innovative equipment that are all available within walking distance and equivalent to those used in the best studios in Los Angeles. For instance, when taking class on sound recording for motion picture, I was able not only to record various orchestra instruments on SCA’s stages, but also mix recorded instruments and songs in available sound mixing suites. SCA’s esteemed faculty never hesitated to share their knowledge and expertise with me. I benefited greatly from faculty advisement when putting together treatment for Crossing Desert and Sea. 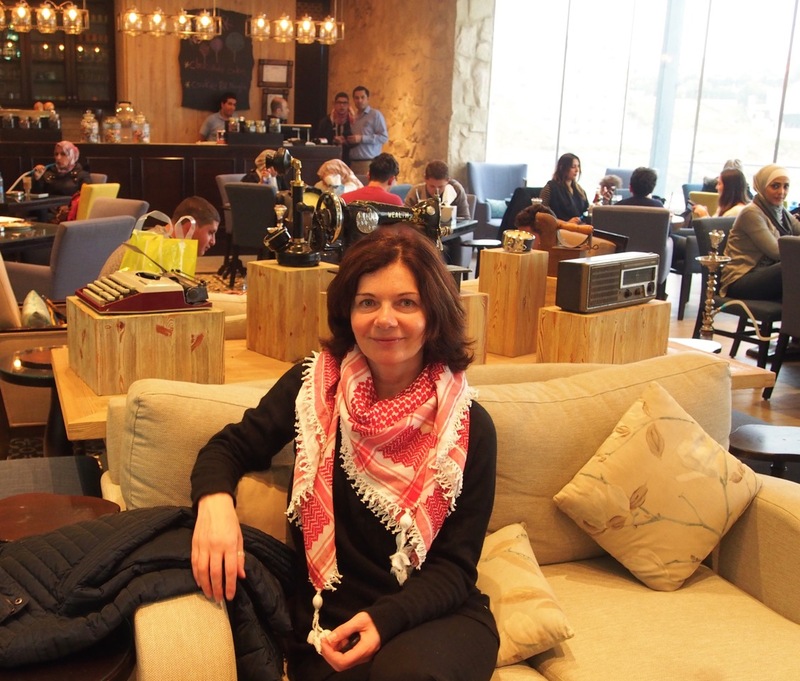 Professor Pablo Frasconi introduced me to people who had contacts at the UN in Europe; consequently, his contacts introduced me to the UN representatives in Amman, Jordan who facilitated my access to refugee camps in Jordan. Michael Taylor, the Director of USC Cinematic Arts’ Media Institute for Social Change, graciously offered to mentor me and an affiliation with his Institute when working on this documentary. In the early stages of development of my project many people feared for me traveling to the Middle East. At that time I spoke with Ted Braun, Director of Darfur Now, who shared with me many useful tips about his trip to Sudan and how I should go about shooting in Jordan and visiting refugee camps. I also would like to emphasize the importance of SCA’s student body. The strong community support and sharing of knowledge and encouragement are very important factors for succeeding. I was able to meet many talented and smart students who believed in me and helped me to become the person that I am now. As the director/producer, what have been a few challenges you have encountered while creating Crossing Desert and Sea? This past summer, the office granting permits for access to refugee camps at the Ministry of Interior was changing and it delayed many permits, including ours. I had to rearrange my shooting schedule with the DP and Soundie, both alumni from the Red Sea Institute (which was funded by SCA and the Royal Jordanian Film Commission). This was very frustrating since it is very difficult to find good soundies with equipment in Jordan. Of course, I also experienced many rewards; many refugees appreciated very much our commitment to make this documentary about their situation. I still keep in touch with people who worked with us and with many refugees. It is a very interesting contrast when you meet some people in the U.S. who would discourage me to work on the project and on the other hand, meet many refugees in the Middle East who would do everything to help make this project succeed. In what ways do you hope this documentary impacts its audience? This is a character-driven documentary that explores how art can be used to heal, empower and generate hope in Syrian and Iraqi refugee children—children who have no home, no school and nowhere to go, and who have been traumatized, silenced and emotionally scarred by brutal wars. Together with two other artists, we have been providing the children with the tools they need to express their cross-cultural experiences through drawing, painting and photography. And through this documentary, I aim to inspire social change by raising awareness about one of the biggest humanitarian crises of our time and inspire peaceful connection among people from different cultures and religions. What advice do you have for current SCA students? Many students want to make the best films they can at SCA, but they do not realize that this is the perfect time to experiment with various styles and be bold and courageous in their vision. This is the time to learn and dare to take artistic risks. This is also a good time to make mistakes and learn from those mistakes. What’s next for you? Last November, I traveled from Beirut to Paris and, then, to Los Angeles. A day after I left Beirut, the bombing terrorist attack occurred in Bourj el-Barajneh, a municipality located between Beirut-Rafic Hariri International Airport and the town of Haret Hreik. The following day a series of terrorist attacks took place in Paris that killed about 136 people. These terrorist attacks deeply affected me because I realized that I was very fortunate they did not happen the day I was on my way to the International Airport in Beirut or when I was in Paris. The rise in worldwide terrorism in recent years cannot be ignored especially after one of the most beautiful cities in Europe was attacked. These events have caused me to turn my attention to raise more awareness about human rights violations that have occurred and, sadly, continue to occur today not only in Syria and Iraq, but also other parts of the world. Currently, Professors Michael Peyser and Michael Taylor are mentoring me as I am putting together a producing package for a script on Holodomor, a genocide by hunger that killed about 8 million Ukrainians during 1932 and 1933. I am hoping to find investors for that script and turn it into a movie. In general, I would like to make movies and documentaries that have social impact and inspire audiences to make this world a better place. Is there anything else you would like to share about your journey as a filmmaker? I want to express my gratitude for those who believed in me and have supported me during my journey. I am grateful for all the people who have helped me along the way to get to the place where I am now. If anyone would like to learn more about the Crossing Desert and Sea project, more information can be found on our official webpage: www.crossingdesertandsea.org. This project is co-produced with Professor Michael Taylor, the founder and executive director of the USC Media Institute for Social Change (uscmisc.org). Donations are tax-deductible and can be made through the Crossing Desert and Sea website. We have also partnered with the USC Credit Union to create this fundraiser: www.crowdrise.com/crossingdesertandsea/fundraiser/grazynakolondra. The raised funds will be used to cover costs associated with the next phase of production in Jordan and also post-production costs. Thank you for all your kind assistance and support.